Order your Field Day shirt by May 1st! Shirts are $10. Click here for the order form. Do you need quality after-school care for your child? Is your child going to be in Kindergarten through 5th grade at Holiday Heights? If so, our Huskies Extended Day Program is just what you are looking for! Please click the link below for information about HHE Extended Day program. Please remember that all students must be dressed and groomed in a manner that is clean and neat, and that will not pose a health or safety hazard to themselves or others. 1. Shirts, tops and dresses should be modest and appropriate for school. 2. Tank tops (straps less than 2 inches) are prohibited. 3. Shorts should be no higher than fingertip length. 4. All students must wear appropriate footwear and must wear closed-toed shoes for PE. 5. Students must wear shorts/leggings under skirts and dresses. 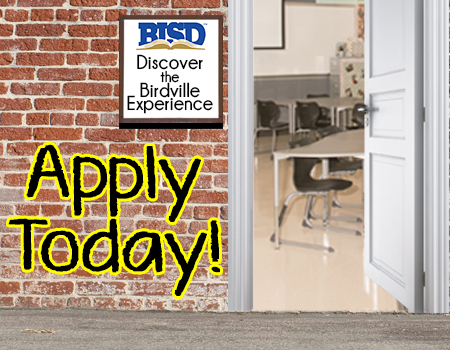 Choose Birdville Schools! BISD’s Open Enrollment for the 2019–20 school year is Feb. 22 – April 12. Apply for Open Enrollment for 2019-20. STAAR Math and Reading scores for 5th and 8th grade for test in April 2019 Available Online! The 5th and 8th grade STAAR Reading and Math results from the tests taken in April 2019 will be released soon (4/30 – Texas Assessment Website and 5/2 in Skyward Family Access). > Click title to view steps on how to review your student’s results. Help us, help you. Submit a tip!